A trusty wheelbarrow is one of the first things any respectable gardener will need once you upgrade from anything smaller than pot. Fortunately, unlike the wheelbarrows of yesteryear, we’ll have more than just old hulking steel models that are encrusted with concrete from its last job. And for the discriminating gardener, only the best wheelbarrow will do. 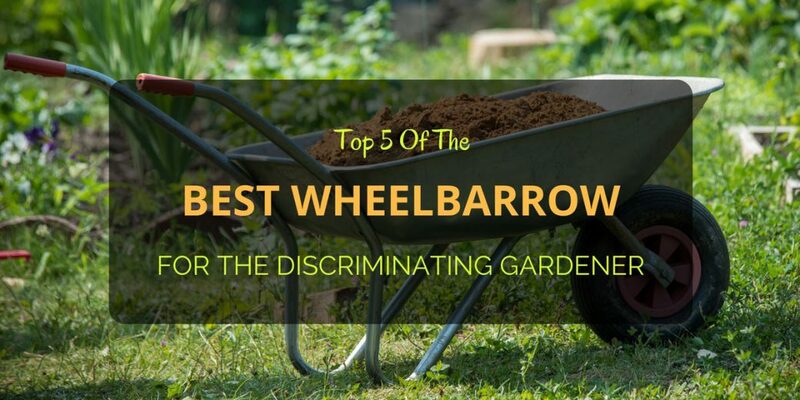 Hence, we’ll take a look at five of the best wheelbarrow you can have for your garden projects. First, take a brief look at the models we’ll be reviewing today. Afterward, you may consult the buyer’s guide, so you’ll be thoroughly prepped to determine the best and your next wheelbarrow. Before choosing your next wheelbarrow, you should first consider the kind of work you’ll be doing. For example is your typical everyday gardening and yard work mainly composed of light cleaning, maintenance, which may at times involve moving mulch, clippings, leaves and the like? Then, maybe a lightweight wheelbarrow may be best. On the other hand, are your yard projects composed of heavy-duty work that involves moving large and hefty objects such as rocks, large plants, thick logs and so on? For this kind of work, a vast and sturdy wheelbarrow, preferably with durable poly or steel tray will be ideal. After determining the purpose for which you’ll primarily use your wheelbarrow, let’s take a look the features and elements you should consider. The materials that make up the wheelbarrow will give you a good idea as to the workload for which it’s intended. Hence, light-duty wheelbarrows will be lightweight, with a minimally-designed frame. Meanwhile, semi-heavy to heavy duty wheelbarrows will, of course, be bigger, heavier, and will incorporate designs that complement its more cumbersome tasks. One important design feature that complements heavier tasks is the capacity and material quality of the tray. On the topic of the wheelbarrow’s tray, the features to look for would be how much material you can move and how heavy those materials can be, which are expressed, respectively, in volume (cu ft) and weight (lbs). Another important element to consider is the design and quality of a wheelbarrow’s handles. You’d want a sturdy handle that will be strong enough to support the load while still staying comfortable to use even during extended periods of use. Last, but not the least, you should consider the type of tires on the wheelbarrow. Typically, you’ll find three different wheel or tire designs. Pneumatic tires are similar to the tires of a car but of a smaller size. Hence, these tires need air, re-filling, and occasionally suffer flats or deflation. However, their necessary maintenance balances nicely with their cost-effectiveness, lightweight, and impact cushioning. Usually made of polyurethane foam, flat-free tires have similar, but lesser, impact cushioning and land handling to a pneumatic tire. However, these solid tires have the added benefits of never going flat as well as improved toughness. Somewhere between air-filled tires and flat-free tires are semi-pneumatics. Think of a flat-free tire, but instead of a solid material, semi-pneumatic tires are hollow. Although they also do not need to be filled with air, semi-pneumatics provide greater cushioning and bounce as opposed to solid tires. Starting off our list of the best is the compact as well as foldable wheelbarrow from Bosmere. With a PVC backed polyester bag for the tray, the W302 is remarkably light at approximately 10lbs and also makes room for three storage pouches for easy access to your garden tools. The Bosmere’s frame and solid flat-free tires are ideal for light-duty yard work such as transporting clippings, various mulching, leaves, small plants, and potting mix. Unsuitable for heavy loads such as pebbles, compact soil, large plants, and others. Next on our list is the Marathon Dual-Wheel, so named due to its two large pneumatic wheels that absorb a lot of impacts. Additionally, the dual-tire design improves the stability of the wheelbarrow especially when you will use it on the unstable or rocky terrain. With its cushion-grip loop handles, you’ll easily be able to lift, push, dump, and even pull loads up to 300lbs in weight. Also, the handle designs let you hang the wheelbarrow on the wall in your yard. At 29lbs, the Marathon weights markedly less than its heavy-duty counterparts. This lightweight is most likely due to the rust-proof 5-cubic foot poly tray that’ll be ideal for light to semi-heavy duty yard and garden work. Hence, whether you’re moving heavy bags of fertilizer, topsoil, yard waste, logs, stone mulching, potted plants and the like, your garden projects will be a breeze with the Marathon Dual-Wheel. My personal favorite in the non-steel wheelbarrows is the Ames CP6PS with its sleek, black, and corrosion proof poly tray. Its single large pneumatic wheel is great at cushioning impacts as well as improving maneuverability as you go about your garden. However, what I love most about this wheelbarrow is its unique spout design! This feature makes distributing and pouring loose material, such as mulch or topsoil, easy and efficient. I would imagine that this will also contribute substantially to construction as you can quickly pour concrete. Complementing the spout design when it comes to pouring loose material are the tough front braces which act as extra leverage as you lift and tip. The Ames’ wood handle is generally adequate when it comes to comfort, but I would usually wear gloves if I plan to do several hours of yard work. So, when testing its more than 400lbs load capacity and 6cubic feet cargo volume, make sure to put on protective gloves. If you need to move large rocks, heavy soil, large plants, and other hefty garden fixtures, then we’ll need to leave the poly trays behind and go with sturdy steel trays. Enter the Jackson M6T22 with its 16-inch tubed pneumatic tire, heavy-duty steel tray, and reinforced steel frame. You won’t just be able to carry heavy things, but you’ll also be able to bring a lot of them with the Jackson’s 6cubic feet tray volume and a load capacity of about 500lbs. Design-wise, the Jacskon M6T22 is a stronger and heavy-duty version of the Ames CP6PS sans spout. Also, the frame of the M6T22 is reinforced with still joints and braces. However, it might also share the Ames’ weakness, similarly-designed handles that become decreasingly comfortable the heavier the loads you bear. I don’t personally own a WORX Aerocart, but when I do need a new wheelbarrow I’ll definitely consider buying one! Where do I even start with this multi-purpose machine? In addition to being a steel tray, dual-tire wheelbarrow, the Aerocart also functions as a yard cart, bag holder, trailer tote, rock/plant mover, a standard as well as an extended dolly, and finally, a cylinder holder. Undoubtedly, the WORX Aerocart is a wheelbarrow you’ll have to test for yourself as its many uses can effectively be in the hundreds. Also, its Turbo Lift designs carry most of the weight which means heavy objects will feel markedly lighter on the Aerocart! Adding to all these functions is the dual flat-free tires, comfortable cushioned handles, as well as a unique narrow frame that lets you work through tight spaces or paths in your garden.